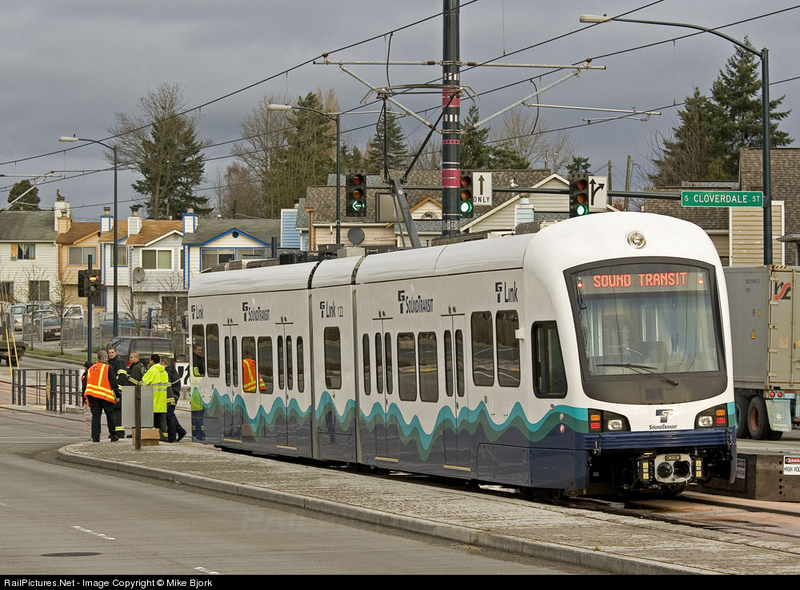 Here's what finally will go into real operation in the Seattle area in a couple of months. Its just one line between downtown and the airport....but its a start. NOTICE: This topic has been split off from http://www.jnsforum.com/index.php/topic,1296.0.html I close this spot as the subsequent reply below quotes this post. Yeah, LRT is better than nothing but, saddly, that's really a small start. For sure. I hope that the service will be more consequent that the usual (for USA) a train per half hour during rush hour and a train per hour the rest of the time. In order to be succesfull public transportation really needs high frequencies. That's what I've been saying about our local bus service for years. You can't get people to ride when most of the buses are on 20- to 30-minute headways. Yeah they are nice. I've seen some here and there. But, maybe I'm wrong, it strucks me as more efficient to start with some kind of BRT service and then upgrade it to light rail when it's necessary. The minibus can then serves as feeders for the system. That would be nice, but I'm not anyone here believes our town would have the number of riders necessary for light rail. Of course there's not much of an incentive in the states for rail or bus transit, people really are unwilling or unable to give up their cars. Example, while I'm 30 minutes from DC, I live in a rural farming area. Most things are in walking distance, but if I need to pop over to Frederick or DC, it's a drive.We have bus service on 90 minute headways and even then the buses lose money as they run empty. Bus services in the states is not focused on mass transportation but rather public transportation to enable the elderly, handicapped and poor to move about; has been since the 50's. There are some cities like Pittsburgh where parking is such a premium where people are forced to take buses and the trolley because the roads are too narrow to accommodate traffic, but situations like that are in the vast minority. And with gas under 3.oo/gal again, any push from last year's gas wars for mass transit is fading into the background. Americans have short memories. *caught, 70s gas shortage. 90 minute headways... that's crazy. No wonder everybody drives. Studies have shown in Europe that you have to give people 5 to 10 minute headways if you don't want them to drive instead. In densely populated aeras 15 minute headways is allmost considered like hell... I know the subject is endless but it never cease to amaze me. You have to keep in mind in America the average return is about 15% fare box recovery. Transit systems are nearly completely subsidized. Personally I find it amazing how Singapore has a duopoly on a transit system, that not only does not have to be subsidized, but generates a profit. My little town is five miles from FDK, but only has 5000 people. But that is normal. Even in Paris the transport system is heavily subsidized. I don't have the numbers in mind but if I remember correctly subsidies account for around 60%, the rest comes mainly from publicity and then fares. The idea being that, in order to offer that kind of services, fares will be to high. The freaking point being that the RATP turns out a nice profit each year but most of it comes from state/region/departments/community subsidies. The key to note is that the systems over there are turning a profit, our systems run in the red yearly. I don't know of a single system in North America that even reaches breaking even. Like I said, it will be exactly the same in Paris, the whole of France and certainly of Europe. The difference is that here, the necessary subsidies, are accepted and accounted in the books of the companies. Because except for some rare worldwide exemples subsidies are needed in order to run/have a public transportation system. After politics, people can decide if they went to invest heavily and offers real services or cut their lost and offers the bare minimum. Of course there's not much of an incentive in the states for rail or bus transit, people really are unwilling or unable to give up their cars. This is easy for me to say, but I think we'd have to accept a fairly long period of providing good, short-headway service without many riders until it catches on. Of course, no-one wants to budget for that. But you can't expect people to deal with long headways, etc., *before* you provide frequent service. Example, while I'm 30 minutes from DC, I live in a rural farming area. That's another problem--even with the best goals for transit, we have to deal with the after-effects of the unsustainable land-use pattern that we've created. Bus services in the states is not focused on mass transportation but rather public transportation to enable the elderly, handicapped and poor to move about; has been since the 50's. True, and while we need to keep doing that--they're the people who often need it the most--we also have to find a way to get Americans past the "ewww, I can't ride a bus, there are icky poor people on there, and I might be killed--or worse, embarrassed!" kind of thinking. Ride Metrobus anywhere in the district and that stereotype is a pretty well earned common thoguht among people. We sure had a hell of a run on murders, shooting and assaults ON the buses in DC and Baltimore over the past few years. If that's going on on the buses, then it sounds like the bus service has been abandoned to the underfunded world of social service. The reasons may not be very flattering, but murder would be very unlikely on a bus system used by a mix of classes. Well, that's true. Metrobus was so underfunded during the 90's that they cut back funding, ridership dropped so service was cut further reducing ridership. We had GM fishbowls fro the 60's still in regular service up to the mid-90's. Metrorail got all the funding, then one day someone came in took all the Metrorail funding and bought two thousand new buses over 15 years, restored bus funding at the cost of Metrorail funding, now it's the rail that is suffering for cash and is deferring mnt. Now the underfunding of the rail system is under close scrutiny due to the recent incident on the red line,and I'll bet dollars-for-donuts that Metrobus funding gets slashed over the coming years to refocus on the rail system. In FDK we've been trying for years to expand bus service, but any money requested is denied and is sent to Baltimore, becasue mass transit for the state is controlled by MTA (Maryland Transit Administration), but bus operations are run by the counties themselves with the exception of Baltimore City, transit related revenues are always spent in Baltimore and not in any other city with exception to the states contribution to WMATA (Metrobus & Metrorail, DC). 100% of the bus service to the city of Baltimore is proved by the state. Trying to keep this from becoming a rant, which would quadruple the size of this post. I can write another ten paragraphs ranting about the way mass-trans is handled in the state and DC. Lord, forbid I use to write enough editorial on it for the paper a decade ago. Oh I just have to voice out. Everyone knows my view on auto industry's influence on urban planning in N. America so I won't get into that. Toronto has a cost/recovery rate at 75% for urban public transit (TTC) and above thus making almost profitable in N. American standard. Our regional train system (GO Transit) is closed to 80% but on an hourly schedule. What Toronto is trying to do now is to encourage high density, transit friendly development along its major streets by having streetcars or buses running on segregated lane for a speedier more predictable transit journey. We dubbed this method Transit City. I really do hope it will work and help Toronto and other N. American cities out of the dark ages. This is what they've been trying to do in NoVa over the past ten years, but it isn't going so well. (See story on the Silver Line extension to Dulles) Recent trend in design here has to include Metro in the DC area with growth planning but the problem has become not the incorporation the mass rapid transit integration into the urban design scheme but rather the cost. Phase I alone is already at the 6 billion dollar mark, most of which are RoW related costs. It's an issue of trying to grab a billion dollars where the state government are so cash strapped as it is. To2leo makes good points. In North America, roads and road traffic are given enormous subsidies (many of them hidden) and priority over other traffic. Rail doesn't really have a chance. In Japan, nearly all railroads and subways operate at a profit, so they must be doing something right. It is a question of truly costing the service. If one takes the true cost of petrol/cars/trucks by adding up not only the cost of fuel but also wear and tear on the roads, cost of traffic infrastructure and depreciation on those assets, cost of health and pollution etc and factored that into the registration costs of cars and trucks, then this would be a lot less alternative option than trains. It is infact cars and trucks that are subsidised beacsue their true cost os not being passed on but rather absorbed by the taxpayer. In Japan, nearly all railroads and subways operate at a profit, so they must be doing something right. The question is whether you're willing to trade your 1/6th acre lot in exchange for the joys of living 3/4 mile from EMUs on 8-minute headways. Many are. Many more are not. We can have decent trains AND "traditional" (single family) development if we're willing to give them a dedicated funding source. When you have dedicated funding you can do anything. Houston Texas had legislators try to block their LRT system, so they built the first line entirely with sales tax revenues. When your funding is at the mercy of politicians, you get situations like routes get cut and the ones that are left are never on time (Amtrak) or bus riders get shot (Baltimore) or trains crash and kill people (DC). Good discussion here. Disturbman makes a good point re. the high public subsidies for rail/transit systems in Europe- people there want good public transport, and are willing to pay for it (through taxes). OTOH, many people in the U.S. think public transportation and HSR are a "good idea", but are not willing to pay for it-truly an instance of you get what you pay for. Japan is similar to Europe in that public support of mass transit is high, though I think the relatively high number of profitable lines are a result of the singularly tremendous volumes of peak hour traffic these lines handle daily, which are a result (among other things) of Japanese urban/suburban development patterns.